The ground game for the Glasgow Scotties proved too much for the Allen County-Scottsville Patriots to handle last Friday. The Scotties rushed for just under 400 yards in recording a 28-7 win over AC-S---the first loss of the season for the Patriots. Despite the dominance of the Glasgow ground game, the Patriots still had opportunities to put points on the board, especially in the first 28 minutes of the game. With the contest coreless, the Patriots used their rushing attack to push deep inside Glasgow territory late in the opening quarter. A 13-yard run by Kelly Weger, a 17-yard quarterback keeper by Trace McIntyre, and a Weger 12-yard gain moved the pigskin to the Scotties’ 18-yard line. However, the drive stalled near the 10-yard line when McIntyre was sacked on a fourth and three play on the final play of the first period. Glasgow countered with a nine-play, 82-yard drive. Led by Nick Mitchell, the Scotties kept the ball on the ground on their march to the AC-S end zone. Mitchell’s 17-yard run at the 8:56 mark of the first gave the hosts a 6-0 lead. The Patriots responded with a potential scoring drive. Runs by Weger and Cayden Ross and a pass interference penalty on Glasgow allowed AC-S to push the ball to the Scottie 16. Three plays later, Weger’s six-yard stamper left the Patriots with a first and goal at the three. However, a fumble on the exchange ended the 10-play drive with four minutes left in the first half. AC-S would again threaten in the third. Starting at their 22-yard line, the Patriots moved the ball. A 36-yard pass play from McIntyre to Ross pushed the ball to near midfield. Two plays later, Patriot lineman Jordan Madden pounced on a loose ball to keep the drive alive. Four plays later, Ross’s end around on fourth down resulted in a 14-yard gain to the Glasgow 13-yard line. Facing another fourth down, Weger would be stopped a yard short at the four-yard line ending the 14-play effort at the 5:29 mark of the third. Glasgow countered with the back-breaking drive. Keeping the ball on the ground the entire way, the Scotties used eight plays to go 96 yards. Quarterback Taylor Abernathy’s three-yard run and a successful two=point conversion gave the Scotties the 14-0 lead with 2:29 left in the first. The Patriots were stopped quickly on their next possession, allowing Glasgow to answer. After hunter Foster’s punt went into the end zone, the Scotties marched 80 yards on eight plays to score. With 10:21 left, Glasgow led 21-0. The final Scottie touchdown came at the 5:49 point in the final period. Mitchell’s one-yard run capped another time-consuming drive with the PAT giving Glasgow a 28-0 lead. 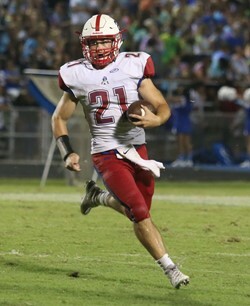 Trace McIntyre’s one-yard touchdown run in the final seconds accounted for the Patriots lone score in the game. Offensively, Weger finished the night with 23 carries for 90 yards. Landen Witcher added 59 yards on six attempts. Through the air, McIntyre went 5/6 for 48 yards. Mitchell led the Scotties with 289 yards on 30 carries. Defensively, Nick Cooper was in on 11 tackles with Dalton Cline in on 10. Peyton Huff and Hunter Foster has eight tackles. Despite the setback---coming against a team ranked fourth in Class 2A---Hood believes his players will bounce back strong going forward. The Patriots will travel to Lindsey Wilson College Friday night to face the Pulaski County Maroons. Pulaski County is a pass-oriented team that will look to throw the ball to multiple receivers. Friday’s game will be at Lindsey Wilson however, AC-S will be the home team as part of the two-year agreement in the series. As a result, AC-S fans can get into the game using their regular season passes while students with all-sport passes will also be admitted free. Kickoff is at 7 p.m. in Columbia.